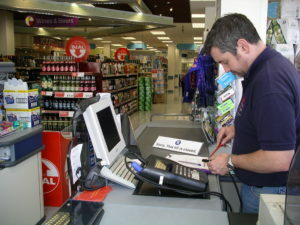 We use computerised test instruments to carry out Portable Appliance Testing (PAT electrical testing). Not only do these instruments have the ability to gather test results in a downloadable software format, they have also been specifically designed to safely carry out testing of sensitive “IT” equipment without causing any damage to the electronics within. These test instruments are extremely accurate, fast and reliable. Together with thorough visual inspections resulting in high quality data, less time on-site and no hand written test results. By insisting that stringent high standards of workmanship are always maintained, we guarantee a high quality service. With a huge portfolio of clients who already engage the services of ETS to undertake routine portable appliance testing, we carry out testing at many thousands of sites on a national basis. As such, our PAT test engineers have a great deal of experience of working within most environments. They are able to carry out testing quickly and efficiently whilst causing the absolute minimum of disruption to the daily activities of your staff and business. We will carry out minor remedial work at the time of test, such as change incorrectly sized fuses, remake, or replace damaged plug-tops if required, thereby enabling us to pass otherwise unnecessarily “Failed” appliances. Also, having agreed appropriate test intervals with you, we will even remind you before your next test becomes due. See Legal Requirements for recommended intervals between testing. A portable appliance is classed as any piece of equipment which can be connected to the common supply by means of a plug and socket arrangement (be it 13-amp or any other). It must be maintained to be safe at all times. Testing of portable appliances is also referred to as plug testing, pat testing, P.A.T. or simply PAT.